Back in March, Amazon beat Apple and Google to the “music locker” punch with their “Cloud Drive” and “Cloud Player”, which offered 5 GB of free storage space and an accompanying music player, respectively. 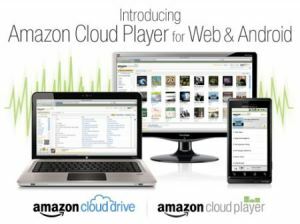 At the time of release, both the Cloud Drive and the Cloud Player were only available on the Web and Android. Today, Amazon is announcing a few nifty enhancements to its cloud-based music locker, including storage plans that offer unlimited space for music, free storage for MP3 purchases, and Cloud Player has finally come to the iPad. While the 25 million-plus iPad owners may be excited to test Amazon Cloud Drive, there will be a price to pay for Amazon’s new enhancements — albeit a small one. The Cloud Drive and Cloud Player will cost, at the very least, $20 a year, which seem to be a very reasonable price for unlimited space for for music storage. To clarify, according to Amazon, this offer is available starting at the lowest price grade, $20/year, which includes 20 GB of file storage and unlimited space for MP3s and AAC music files. As to the terms of these storage grades, they will remain much the same as they were when Cloud Drive launched in March, with customers beginning at 5 GB of free cloud storage, which will allow users to begin uploading their digital music libraries, and presumably get them hooked on the service before opting for more. And, for a limited time, customers who purchase any Cloud Drive plan will receive unlimited storage for no additional cost, so if you want to test out Cloud Drive, the time is now. Amazon has not yet made it clear when it will lift this “limited offer”, but we’ll be sure to update. And though Amazon’s new enhancements are certainly targeted at unlimited music listening, it should be noted that the basic Cloud Drive storage provides support for multiple kinds of digital files, including photos, videos, and documents — a la Dropbox. Amazon also said in its press release that those who qualified for 20 GM of free storage from earlier promotions can upgrade at no cost. For the iPad, Amazon says that the Cloud Player for the Web has been “optimized to offer customers streaming playback of their Cloud Drive music using Safari”. Those interested in checking it out, can go here to learn more. This announcement comes hot on the heels of Apple’s iCloud offering 5 GB of free online storage along with synchronization for music, photos, apps, documents, iBooks, contacts, e-mail and calendars. Dropbox, Google, Microsoft, and Amazon have all now jumped into the cloud storage game, which will you choose?